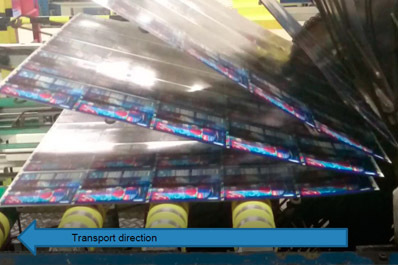 Cazander is responsible for UPnovations regarding coating and printing lines for tinplate and aluminum sheets. Vacuum controlled transport of the sheet into the oven. Slowing down the sheet while entering the oven inlet with vacuum instead of the usually applied magnetics brake. Thus, the transport works out more smoothly and also cleaner, for the magnets are often collecting iron and dust particles. Vacuum controlled transport of the sheet from oven to stacker. The outfeed of the oven is provided with a servo-driven vacuum belt that accelerates the sheets to the line speed of the stacker. This ensures there is no hard contact between a sheet and an already running belt. The outfeed monitors the sheet movement and detects if a sheet is not transported as the next wicket arrives. The oven is then stopped and the outfeed belt lowered. This prevents wickets from being bent as a result of a crash. Precise position drop of the sheet without scratching. The stacker detects the end of the sheet and positions it precisely at the drop position. It is then released onto a pallet without scratching. This is done with electro controlled magnets for tinplate and vacuum belts for aluminum sheets. Movement of the complete tunnel oven without dismantling panels and burners. If the oven has to be moved, for example to put a printing machine between feeder and coater, this can be done without complete dismantling. An important advantage of not having to dismantle panels and burners is to avoid issues of asbestos removal. 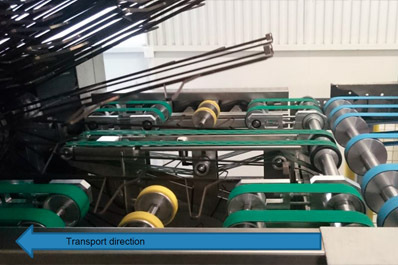 New line controls enabling the synchronization of the complete sheet transport system from inside the main control. This main control contains a safety CPU and a number of servo drives. A virtual axe is created where all axes will refer to on which a stable reference signal will be the base for the transport. Features of the control system enable modules to be controlled while retaining the overall control of the line. Examples of this include the stopping of the coater while the oven continues to run and also the running of the lacquering machine while the oven has a standstill. Conversion of a standard LTG burner control to a MultiBloc burner control. We assemble the burner and gas and air aisles into compact control lines and these can easily be inserted into the connecting pipe work. The burners can still produce around 10% extra power under good conditions. All burners are in accordance with NEN-EN 676 standards and are CE compliant. Each burner unit is standardly fitted with a separate air pressure monitor. The MultiBloc gas block consists of one gas filter, duplex gas valves and gas pressure monitoring. The burner is equipped with a power supply, control signal and feedback.